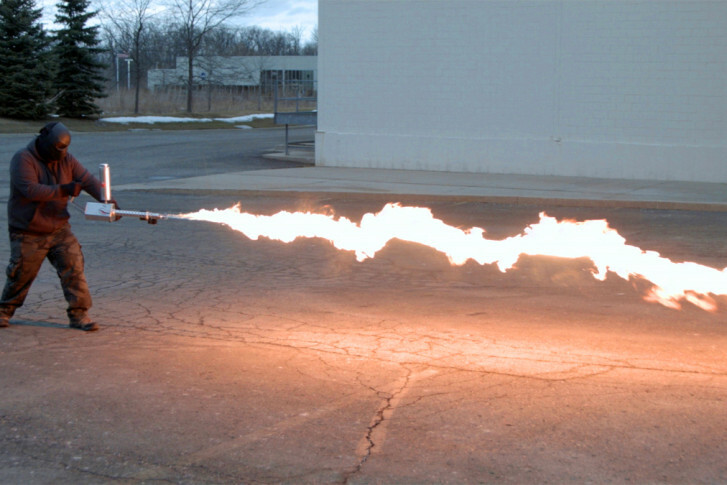 The XM42 personal flame thrower spews flames 25 feet in the air. WASHINGTON – A soon-to-launch crowdfunding project to build “the world’s first commercially-available handheld flamethrower,” is sure to heat up buzz online, as well as questions about the safety or legality of a device that spews a column of 87-octane flames 25 feet. Chris Byars, CEO of Ion Productions Team, says the XM42 flamethrower would have several purposes. “This does seem to appeal to a decent market, though,” says Byars. On Monday, Byars and his colleagues will begin an IndieGoGo crowdfunding campaign. “I’ve always wanted to build one,” says Byars, who began working on prototypes in 2008, and built the current version with help from interested machinists. The flamethrower has two tubes next to each other. In promotional videos, operators wear protective suits. Even though operation of a potentially dangerous flamethrower wouldn’t require licensing, Byars believes owners would use them responsibly. “Misuse of any item should punish the offender, not the tool, as far as we’re concerned,” says Byars. On its website, the company said flamethrowers are legal in 49 states, with the exception of California. Montgomery County battalion chief Kevin Frazier, bomb squad commander with the county’s fire and explosive investigations, begs to differ. “No, this is illegal in Maryland,” Frazier tells WTOP. While the product may be legally built, “if you’re in possession of that flamethrower (in Maryland), you are illegally possessing that destructive device,” according to Frazier. He believes other states would also characterize flamethrowers as destructive devices. Virginia’s fire code prohibits attaching a flamethrower to a motor vehicle. When told by WTOP about the Maryland code, Byars acknowledged there may be places where owning or using flamethrowers is illegal. “We will investigate as many laws as possible ASAP, but always have the disclaimer to check state/local laws,” said Byars. The website now reflects flamethrowers are not legal in Maryland. When preordering begins with the IndieGoGo campaign, the XM42 will cost $699 for brushed aluminum, or $799 for either polished aluminum or a colored powder coat.